The Sunken Living Room is an exhibition of contemporary art that investigates the most recent economic recession. 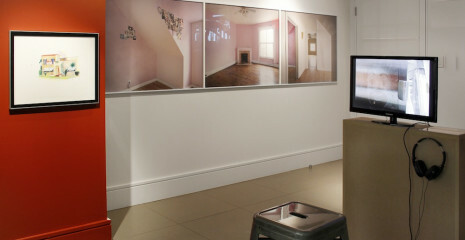 The show’s title simultaneously reflects the interior design phenomenon of the lightly stepped down or “sunken” living room, popular during the 1970s recession, and the crash of the housing market in 2008. Using sculpture, video, texts, drawings, prints, and photos, artists working today tackle recession-related topics that include: labor, debt, the collapse of the housing market, post-industrial cityscapes, unemployment, and banking practices. The exhibition is curated by Terri C Smith and is on view March 22 – May 25, 2014. Through a mix of documentation, observation, allegory, and autobiography, the twenty-four artists in this show lend unique perspectives to recent fiscal crises. Some take an individualized approach, overlaying their work with personal experiences and narratives as with Kirby Mages’ video Where’s the Proof? where she combines information on bank bailouts with diaristic voiceovers, or with Danna Vajda’s Tearsforfears installation where the artist uses her own crumpled receipts as source imagery to explore money spent that leaves no physical trace but the transaction’s record itself. Others in The Sunken Living Room capture current events by resituating elements from cities into the gallery, such as Anya Sirota + Akoaki’s Piranesian Bling series of sculptures that are modeled after disused elements at Detroit’s abandoned Packard plant; and Beate Geissler and Oliver Sann’s photo series, the real estate, which features images of foreclosed apartments in Chicago, Illinois. Documentary style works also are included in this exhibition. Ana Pečar & Oliver Ressler’s video In the Red follows the group “Strike Debt,” an offshoot of Occupy Wall Street that organizes events and protests relating to debt, and Kevin Jerome Everson follows two Cleveland men who repurpose alloys throughout the city to earn income in his film Fe26. The exhibition is also embedded with references to the 1970s, another recession era. Disco is front and center with Kerry Downey’s video Nursing Disco; workers rights and union slogans appear in Andrea Bower’s Workers Rights Posters; and seventies cinema informs the title of Olga Koumoundouros’ essay “The Getaway,” which is also the title of a 1972 film with Steve McQueen and Ali MacGraw. In the Franklin Street Works café, music from the mid and late-1970s, takeaways by Koumoudouros, and Jonah Emerson-Bell’s sculpture “This dude knows where you live” (which incorporates a Bootsy Collins album from 1978) touch on that decade’s popular culture landscape. Thinking about artworks made during the 1970s recession, the site specificity of the city of Stamford, and in keeping with the exhibition’s themes of exchange and value, five artists were asked to recreate pieces from the UBS bank collection that date from the seventies. UBS has a corporate location in Stamford, Connecticut, and houses the largest stock exchange floor in the world — roughly the size of two American football fields. Each artist was paid a small honorarium to make an artwork by a blue chip artist that conjures art-as-investment, but in actuality has no monetary worth. This special project within the exhibition highlights economic themes surrounding art, including the subjective nature of an artwork’s value and the commissioning of artworks in exchange for payment. By combining artworks from today with popular and high culture items from the past, The Sunken Living Room connects shared cultural experiences with contemporary projects to explore the utopic desires and deflating exasperation of post WWII recession economies. Anya Sirota + Akoaki, Michael Bell-Smith, Andrea Bowers, Ingrid Burrington, Nancy Davenport, Kerry Downey, Jonah Emerson-Bell, Kevin Jerome Everson, Beate Geissler and Oliver Sann, Olga Koumoundouros, Urich Lau, Mads Lynnerup, Kirby Mages, Rainger Pinney, Oliver Ressler and Ana Pečar, Sal Randolph, Danna Vajda, and Constantina Zavitsanos, with special projects by Alberta Cifolelli, Roxanne Faber Savage, Peter Gramlich, Liz Squillace.